Everyone wanted a PDP-8 minicomputer. Well, in 1968. Blinkenlights! Just boot the SD image on a Pi, maybe add the front panel later on. Any small switch works fine, but I made my own 'PDP-8 replica switch' for good looks. Any Pi from the A+/B+/2/3/Zero will work. Bootable SD card image works on all of them except the 3. For the 3, install the tarball on Raspbian instead. 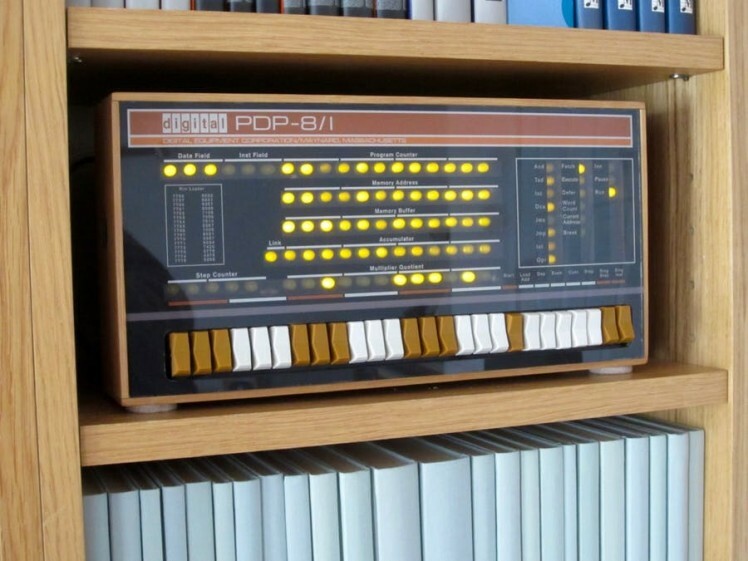 Project goal: to create a faithful, low-cost replica of the PDP-8/I minicomputer (1968). Operated through a Blinkenlights front panel, it should bring back the user experience from the past. Replicating all stages in its development: from 1968 to 1979, from teletype & paper tape all the way through to hard disks and multi-user systems. See my PiDP-8 web site for full details on the kit. Why not? 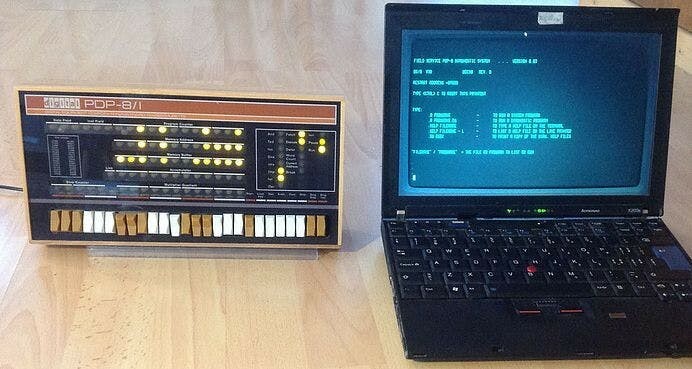 To illustrate how utterly unique the PDP-8 was in the evolution of computing. Born in the era of paper tape chewing, front panel programmed dinosaurs, it evolved all the way to running a proper operating system (even multi-user virtual machines!) from 10MB disk cartridges. It was pretty much the prototype of a personal computer. Low-cost hardware hack: insert the Pi to the "Blinkenlights" front panel PCB and you have a fully functional hardware replica. Board can be made from the Gerbers by OSHpark, Seeedstudio, Elecrow or anyone else. Or buy it from me ($15, leave a message here). Fancy version: I made this into a $145 kit, with pretty acrylic front panel, custom switches and bamboo case. See here (link) for details on when the next batch of parts is made. See here (link) for details. In summary: control the world, or play the very first video game (spacewar), or hook up 8 terminal sessions to run your company. It's a minicomputer... The PDP-8 is also an incredibly good way to learn about how a computer works at the lowest level. Because it is a very simple machine, yet has loads of good software. Because a Raspberry Pi is rather more powerful than you need to replicate a PDP-8, it's dual-mode. Whilst the PDP-8 is running and blinking its front panel, you're free to use the Pi Inside to do whatever else you want to do with a Pi. Use it as a file server, VPN access point, or whatever. Just with a very blinky front end. In case you do not have a vintage serial terminal: use cool-retro-term instead. See my PiDP-8 web site for full details. Actually, see my web site for future updates.